My regular recipe for Deviled Eggs is really quite simple. You have your eggs of course. The filling consists of just egg yolk and mayonnaise and then a sprinkle of paprika. I decided to try a different recipe that I discovered on the Better Homes & Gardens Recipes app. This recipe does not have paprika! Even John asked where it was. Devilish Eggs only take a few extra ingredients. I love the addition of Dijon mustard. It gives them an extra boost of flavour. Not your ordinary deviled egg recipe. This easy appetizer has Dijon mustard, ham and NO paprika! Halve the hard boiled eggs lengthwise and remove the yolks. Set the whites aside. Put the yolks in a bowl and add mayonnaise, sour cream and mustard. Stir to combine. Stir in ham and green onions. Season with salt and pepper. Stuff yolk mixture in each egg white. Cover and chill until ready to serve. I loved deviled eggs. I use sweet relish instead of chives but I will have to try that some time! You have officially decided my lunch for today. Yum! I love deviled eggs. I never put ham in them before. I will have to try this out, thanks. I have chickens so I love egg recipes! Thanks for the recipe. My daughter has recently found out that she LOVES deviled eggs! I have never before made or tried them, lol! I have some family members that don’t like saying deviled eggs so they call them harassed eggs lol! These look delicious. 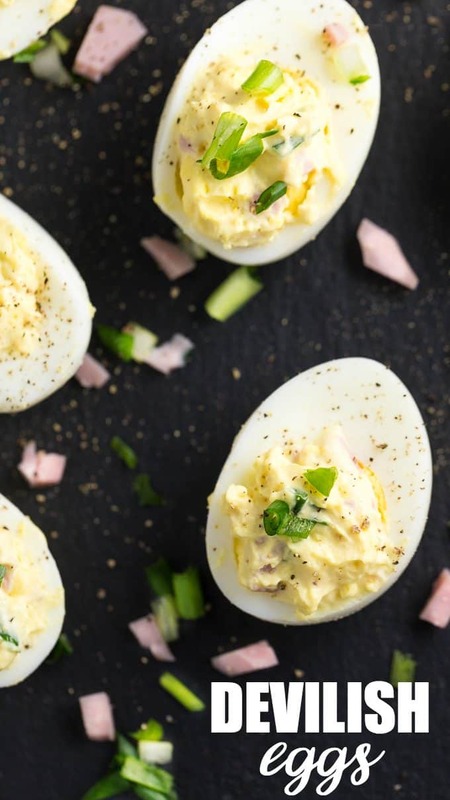 These sound delicious–I love dijon mustard with my deviled eggs. New twist on an old recipe. I love it and I am going to be making these soon for sure! Thanks for posting! I’ve never heard of using sour cream! I will definitely have to try this. Thanks! 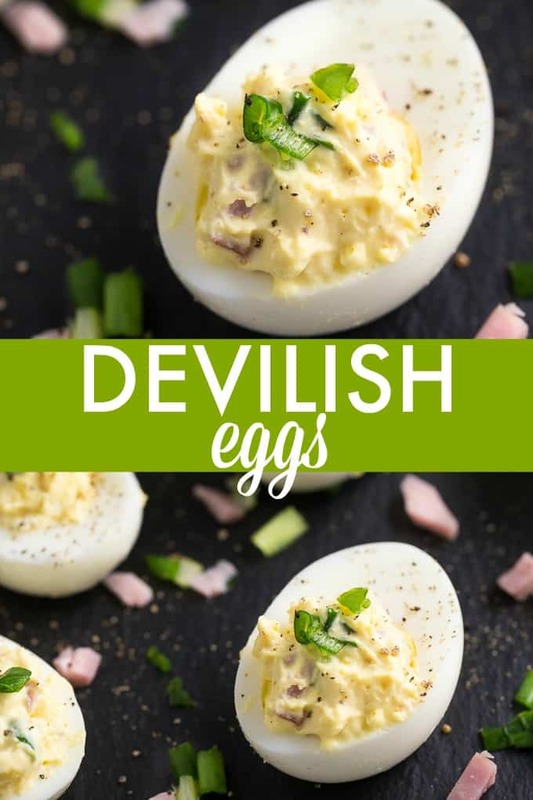 I’m not a ham fan…but I do love deviled eggs and trying new variants on them, so maybe I can think of something to substitute for the saltiness…. Nice take on the classic. I will give this one a try too, thanks. I think Dijon mustard goes very well on eggs, but paprika is so perfect… I’ll try anyway, ’cause it seems yummi. this is a great recipe, cant wait to try it! this recipe looks great have to try it.. The Dijon mustard sounds amazing!! I love deviled eggs!! I love love love deviled eggs. I can eat like 12 in one sitting LOL. I will definetely be trying out this recipe. Love this take on Deviled Eggs. I didn’t have the materials to make this exact recipe, so I did what I could and mixed mayo and horseradish mustard (to taste) and sprinkled with paprika. Tasted delicious, but I think I’ll have to try this recipe someday. Dijon mustard? That is genius! This was my first time putting meat in them. You could always substitute with a meat you like and see how it tastes. For me, I also like bacon (but that’s still in the pork family). These sound so good. I love the idea of putting some ham in them. thanks for the recipe. YUM! This looks like a great twist on an old favorite! I love deviled eggs! I am a huge fan of deviled eggs and your recipe sounds delicious. I always put prepared mustard in my recipe but never ham..I will definitely be trying out this new recipe next time love the addition of sour cream. Thanks for the recipe. I really like deviled eggs but I wouldn’t have thought to put some kind of meat in them. Oops. One extra “t” in there. i love deviled eggs….whenever there is a pot luck to go to or our parties my devild eggs are a big hit…love them…going to try your recipie…thanks for sharing it! I just saw a recipe that called for guacamole it looked good! This recipe I would sub for bacon instead of ham! Both looks good and I will have to try all 3! Adding cooked ham is an interesting idea, wouldnt have thought to add meat to deviled eggs 🙂 I think the mustard would add a nice zing 🙂 definitely going to try this at our next family gatherings. Nice twist on an old standard. Thanks! I’ve marked this to try one of these days. one of my favorites and must try your recipe! 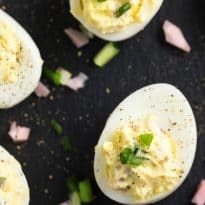 I love deviled eggs – but have never thought to add in ham 🙂 Great idea! Pinned! Yum deviled eggs! Thanks for sharing at the Inspiration Spotlight Party. Pinned & shared. I haven’t had deviled eggs in years! With the ham added, a few of these would make breakfast for me. Pingback: Creativity Unleashed No. 162 - And An Oriental Trading Giveaway!